What Will Patient Care Look Like in the Future With Wearables? Wearables have made groundbreaking strides by transforming how patient care is practiced and delivered – but this is only the beginning. With the global medical device and mobile health-monitoring market growing at more than 43 percent per year, the future of healthcare is in the solutions. Emerging mobile technology empowers physicians and patients to make better-informed decisions. By creating an ecosystem of connected, wearable devices, physicians can deliver timely care and monitor patient activity in real-time to make healthcare management easier for patients. Technology significantly impacts healthcare with almost 70 percent of clinicians using both desktop/laptop and a smartphone/tablet to access data. Healthcare information technology has the power to engage and empower consumers and patients to better healthcare outcomes by providing technologies that enable the seamless capture of physical health data. Healthcare IT also has the ability to facilitate the secure communication of this data between consumers, patients, family members and providers. What we’re doing at Samsung is forming solutions to create clinician decision support systems. There are a lot of opportunities to engage both patients and physicians. Tablets, smartphones and wearables create an environment where healthcare professionals can access patient data in real-time. This consistent communication helps physicians monitor and record vital signs, be in receipt of health alerts and securely access patient records. As health information goes digital, concerns grow about the privacy and security of captured data. However, there are major initiatives being launched at federal and state levels to encourage the adoption and use of health information technology. Samsung’s industry leading KNOX security platform allows us to effectively address these security and privacy concerns. By 2018, approximately 25 percent of individuals with diabetes and cardiovascular conditions will be prescribed mHealth disease management solutions, according to Frost & Sullivan research1. 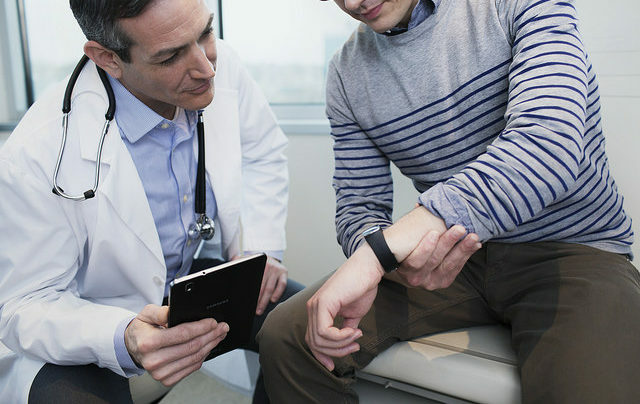 Wearables enable physicians to provide in-the-moment healthcare that is easy, connected, and secure to improve health outcomes. Through mobile health management, patients have the potential to curb major health risks through telemedicine. By monitoring daily activity, physicians can provide real-time guidance that encourages healthy living. Our approach at Samsung is to leverage the broad array of consumer-oriented devices that people use every day to make things easier and more convenient for patients undergoing treatment. In an effort to help manage chronic diseases, Samsung and Medtronic have joined forces to develop connected health solutions for the millions of people suffering from chronic pain, movement disorders, incontinence and other conditions who could benefit from neuromodulation therapy. Patients undergoing neuromodulation therapy will capture real-time health data, so physicians can more effectively manage treatment, track symptoms, and wirelessly monitor data received from Medtronic devices. As we experience these changes, the monitoring and medical device market may reduce healthcare spending in the U.S. by $200 billion over the next 25 years. Through this Medtronic partnership, Samsung hopes to allow patients implanted with neuromodulation therapies to use their mobile devices to securely and wirelessly transmit real-time data to their doctors. The benefits of allowing physicians the opportunity to make quick, informed, data-driven decisions could create a revolutionary impact on personalized healthcare. As a former infectious disease specialist at UCLA, to leading a team at Samsung that connects patients and their providers via the cloud, I’ve seen how we can go beyond healthcare portals to digitally connect everything that patients use at home – from televisions, appliances and mobile devices – to make things easier and more convenient. Today, many solution vendors address different aspects of patient care. Each solution provides value, but collectively it can be challenging to ensure that the solutions all work well together and on a common platform. At Samsung, our goal is to help unify patient care solutions onto a common communications platform, which will connect Samsung and non-Samsung devices and create an overall user experience that is easy to use, secure, and part of one’s daily lifestyle. 1 David Rhew, M.D., “Improving Cancer Outcomes with Digital Health Technology” (presentation, CEOs Against Cancer, Washington D.C., September 29-30, 2015).